Just wanted to write a couple of words about using the chat and mail in the game. 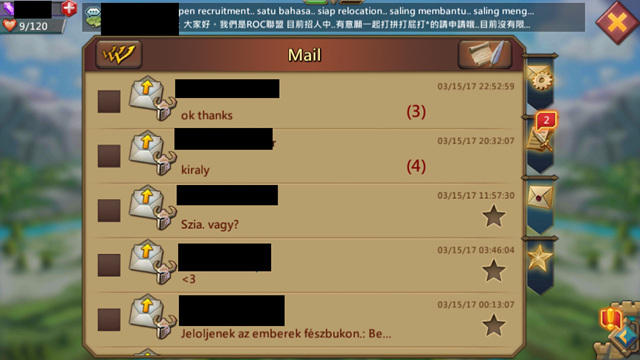 Chat and mail is a very important part of the game as this is how you communicate with your friends, guild mates and also enemies. 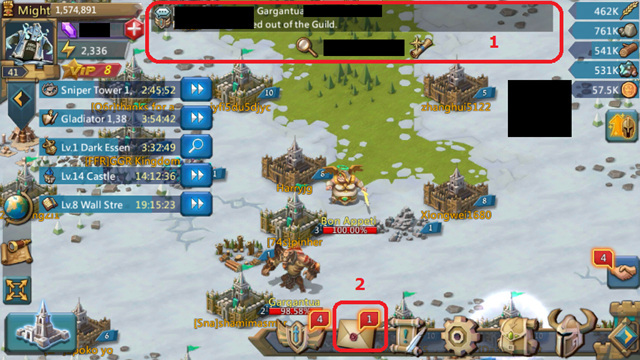 In the Red box marked with 1 you can find the chat where you have access to your guild chat (even if you have guild mates in different kingdoms) the chat will work. You also have access to your current kingdom chat. The Red Box marked with 2 is your mail where you can get various things – more details below. The below image indicates how to jump between the two chats. 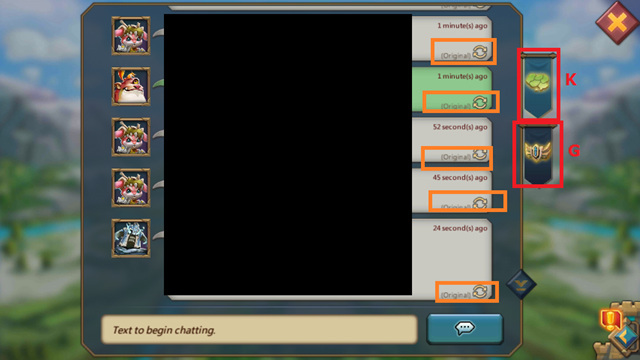 In the guild chat only you and your guild mates can talk although the kingdom chat is open for everyone. IGG has introduced a very special function to the chat and mail – which is the translate button. It might not be perfect although it is very helpful – the translate button is marked with orange in the below screenshot. Also, the Kingdom chat is marked with "K" and the guild chat is marked with "G"
It's important to note that you have to have a castle level 8 to be able to send any mails to other players. Although a warning pop-up will show if you attempt to mail anyone. You can also save messages as favorite – which is helpful in case you want to save some battle reports or messages from players. Another great function is that you can bulk select messages for a quicker Delete on the left top corner. 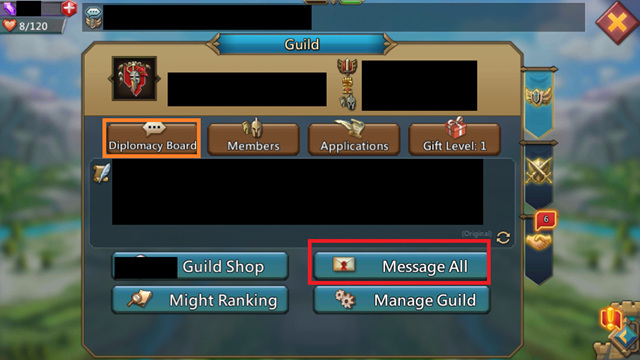 B2 – Guild messages can be sent by Rank 5 and Rank 4 members of the guild. Usually these messages are updates from the leaders, tips and tricks Or any content basically. I've marked function with a red box below. B3 – Diplomacy Board Marked with the orange box below, is a place where a player can leave messages for a specific guild and a guild can reply. Basically to try and talk about "Diplomacy". Most players prefer to mail though. Previous Previous post: [Topic] Who Will Become Next Emperor?